Points of Interest is a jQuery plugin written to replace the once commonplace interactive maps implemented with Flash. 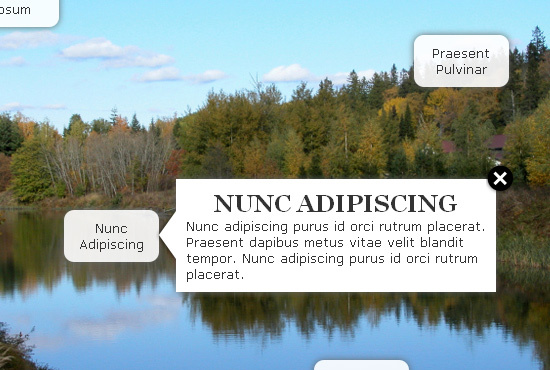 Using one image and two unordered lists, the plugin creates over the image clickable areas which display overlay panels of detailed information. First create a div with the class “pointsofinterest” and give it a unique id if multiple instances of the POI plugin will be used per page. Then list the image being displayed, followed by two unordered lists. The first is for each of the points that appears over the image. Note the two spans which provide the x and y coordinates for the points. The second list contains the contents which will appear on hover or click. End that initial div and the markup is done! Initialize like so for the default presentation. contentsHideOn – can be set to “none”, “click”, or “hover”. When set to “click”, clicking on an overlay hides it, “hover” will hide on hover, and “none” will require the user to use the close button or canvasHidesOn to hide the overlay. canvasHidesOn – also set to “none”,”click”, or “hover”. This controls what effect mouse events on the canvas (the image). When set to “click”, a click anywhere on the image will hide the current overlay, when set to “hover” simply hovering over the image will hide the current overlay, and when set to “none” the close button or overlay itself must be interacted with in order to close the overlays. arrowVOffset and ArrowHOffset – vertical and horizontal offsets for the arrow image which is generated as part of the overlay. These can be used to help adjust the position of the arrow. Neat idea and execution. Does not work in IE though. Tried IE6, 7. Would be great if it did. Nice work though! How do I change the position of the pop up information. The items that are close to the top create a popup window that is cut off.